Bullying is not a recent development. Teen bullying has existed for a long time now. Fortunately, people are speaking up about and against it now. When it comes to teenage, bullying can take on monstrous proportions. Many of us have memories from high school that we would rather forget. The last thing you want, we are sure, is for your teen to go through the same. Teenage bullying can take away your teens life too. But with the advent of the Internet, bullying has taken on a new face. Bullying teens are increasing in number. As a parent, it is important for you to understand how to help your child deal with bullying. So, learn as much as you can about this menace that has the power to hurt and scar your teen for life. Unwillingness to go to school/college or to use the computer. Your teen may request you to drop her to school instead of using the school bus. She may find reasons to stay away from school, which may include frequent bouts of headaches and tummy pain (1). Your teen may lose or damage her belonging. She may also lose money. Your teen may suddenly lose her appetite. Or may come back with her lunch uneaten. Or she may suddenly eat too much and experience weight gain. She may exhibit symptoms such as mood swings, anxiety, depression and social withdrawal. Yes, it is difficult to not make your child’s pain personal. But you need to stay calm to help your teen deal with bullying. You can vent later, in the privacy of your room. It will be so much easier for you to go in and solve the situation. But it won’t help your teen. She needs to learn skills to help herself. So stand back a little and guide your child on how to deal with negative people. There is a very fine line between making it personal and not reacting at all! 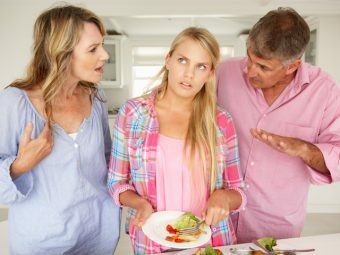 Your teen does not need to be left alone. She needs space, with you watching over her. Don’t tell her ‘it’ll be okay’ or ‘these things happen’.Her pain is real. Don’t belittle it. Victim blaming is the worst thing you can do! Your teen has not done anything that deserves bullying. Don’t imply it. 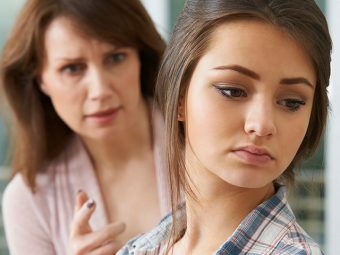 If you blame your teen for bullying, chances are high that she will learn to deal with it by keeping silent. Not something you want, for sure! Now will be a great time to sit down and talk, really talk, with your teen. Tell her about your experience with bullying so she doesn’t feel too alone. Be real. Don’t sugarcoat your words. You can also encourage other adults she is close with to have a talk with her. Surround her with comfort and love. Teach your child not to react with fear. Most bullies thrive on the fear or anger they invoke. When the bullied stop reacting that way, they take away power from the bully. You can also teach your teen the power of words. Using rude words will only escalate the situation. You can suggest using phrases like ‘cut it out’, ‘stop it’, ‘enough’, or ‘this is not funny’ to deal with the bullies. Teach her to walk away from the bully, calmly. The best strategy to deal with a bully is to ignore him. Teach your teen to not react to the bullying and pretend to not even hear him. Spend some time practicing the ‘ignore the bully’ routine at home to help her along. Now will be a great time to help your teen understand the value of good friends! Suggest that your teen move around with friends. The larger the group, harder it will be for the bully to hurt your child. Finally, tell your teen that it is perfectly brave to ask for help. Tell her to talk to a counselor, a teacher, or a school administrator to report the bullying. When the bullying happens at school, it is the responsibility of the school administration to keep things in check. 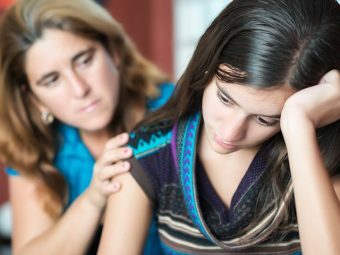 If nothing works and if your teen is unable to manage things on her own and the situations seems to be getting out of hand – step in. Go talk to the school administration directly. You can also approach the parents of the bully to ask for their help. Bullying may be a rite of passage to adulthood for most youngsters. But stop it before it becomes anything more. As to why do teens bully there are many reasons. Today teenage cyber bullying has become a cause for concern too. So, do keep an eye on your teen’s online life and discuss it with her. Posting pictures online can lead to some serious concerns. So talk to her about the ‘do’s’ and ‘don’ts’ of social media usage. Most importantly, be her pillar of strength. Don’t solve her problems for her, but don’t leave her alone either. Let her not succumb to her teen bully. Walk the fine line and become the super parent that you are! How did you deal with bullying as a teen? How are you helping your teen deal with bullying? Share your strategies with us. How To Identify Child Bullying? 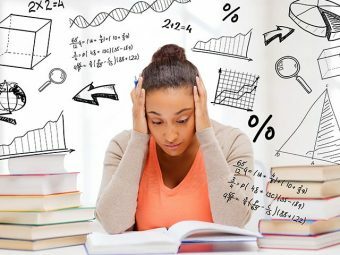 Why Does Short-term Memory Loss Occur In Teens?